Which Brand Has the Best Interactive Treadmill Technology? In recent years, the treadmill market has seen an explosion of interactive technologies to enhance your workout experience. Features like online nutrition tracking, customized workouts, and virtual trail running have transformed a regular treadmill workout into a much more exciting and engaging experience. There are several types of treadmill technology available spanning a variety of brands. Let this article be a guide to help you find the program that best fits your needs. Fitness tracking applications like iFit Live, ViaFit, and MyLiveLight are wonderful tools to help track your fitness progress. On the road to fitness, it is extremely benefitial to measure your results, have a plan, and reflect often on the path you’ve taken so that you can actually reach your goals. Numerous studies have shown that people who take charge of their workouts in this manner lose more weight and make better progress. Each of the above technologies has their positive and negative features. In order to find a starting point, it is helpful to imagine what type of capability you would use the most. Are you the type of person that is driven by the numbers on a scale? Do you need someone to tell you exactly what type of workout to do each day? Are you looking for a way to integrate data from your other apps (like MapMyRun and My FitnessPal) with the data on your treadmill? Or, are you simply looking for a distraction on your console to make your morning run a bit more interesting? Once you’ve answered these questions, you can start learning about the different technologies and make a decision. Any one of these programs has some huge benefits. Be sure to check out the treadmill reviews included on this site so that you can learn about the specific machines that carry these types of treadmill technology! iFit Live is a program available on NordicTrack and ProForm machines. It offers a wide range of interactive features that are accessible through an online account at iFitLive.com. Once your profile is set, you can define fitness goals, track workouts, and follow your progress. We feel the biggest perk to the iFit Live system in comparison to the competition is its ability to integrate with GoogleMaps. You can program in a route anywhere in the world using the map builder tools. Once your route is set, run on your machine while viewing actual footage of this location on your screen. The treadmill’s incline and decline will adjust to match real terrain. The screen can display in satellite, Earth, or street view. 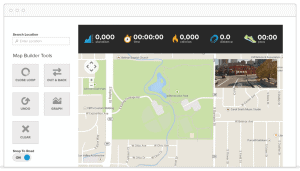 The map builder on iFit Live allows you to virtually run custom routes using Google Maps. If you’d rather run in a pre-programmed exotic location, check out some of the routes through national parks and famous coastal trails. Again, the treadmill’s incline and decline will adapt to the actual terrain while you view your progress on the full color display of your machine. In order to provide additional motivation, iFit allows you to define your fitness goals on the online account and receive an 8-week personalized training routine designed by trainers like Jillian Michaels. New workouts are sent directly to your machine and results are automatically recorded on your account so progress can be tracked. Finally, this platform allows you to enter virtual races, access online workout videos, and share your progress through social media. The main disadvantage for the iFit Live program is the cost. All of the other programs we are profiling in this article are free, while iFit Live requires an ongoing subscription of $9.99/month or $99.00/year. If you choose to stop this subscription at any time, all of these capabilities on your machine become wasted technology. There are a few different types of machines from these vendors that use iFit Live. 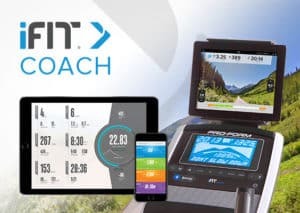 Some machines are labeled “iFit Live Compatible” and actually require a separately purchased Wi-Fi module (~$100 purchase) to link the treadmill to the Internet. The Bluetooth and Enabled machines are ready to go right away with iFit and may or may not require a linked smart device. (This depends on the console display on the unit.) Finally, they have iFit Coach Ready machines that have Bluetooth built in but may need a linked smart device for the screen features. ViaFit is a program available on Horizon Fitness and Vision Fitness machines from Johnson Fitness. This company is the third largest maker of exercise equipment in the world and has a well-deserved reputation for making excellent machines and providing superior customer service. The ViaFit app display shows the major features on your smart device. The ViaFit platform works like iFit Live to allow users to log onto an online account to define their fitness goals like number of workouts, calories burned, amount of time exercising, or total distance. The main distinction with ViaFit is the capability to integrate with many of the fitness and nutrition apps you may already be using on your smart device. For example, if it’s a sunny day and you use MapMyRun to track an outdoor course, this information can be linked to your ViaFit account along with all of your treadmill workouts. If you are on a business trip and run on a hotel treadmill, you can use “X-Capture” technology to take a photo of your workout stats on the foreign treadmill, and have that information added to your ViaFit. Once again, if you want to run virtual trails throughout the world, Johnson Fitness has this capability through their Virtual Active technology. Your speed will trigger the speed of the video and the treadmill’s incline will sync with the hills on your screen. Depending on the machine you choose, this will either be available directly on your console or require a one-time purchase of a Passport so that you can link your treadmill to a nearby television display. This capability is truly impressive and takes fitness and nutrition tracking to the next level. With ViaFit, you can keep better track of your nutrition, workouts, and health stats from ALL aspects of your life to get a better picture of your overall activity. And remember, this technology is free of cost. Compared to the first two behemoth companies, MyLiveLight comes from a smaller company called Yowza out of Ft. Myers, FL. MyLiveLight is a digital hub that allows users to track their fitness goals, nutrition, workouts, calorie intake, and weight using an online app and a cloud based service. It uses information from your user profile to create customized workouts that can be performed while viewing a virtual avatar on your smart device screen (see below). 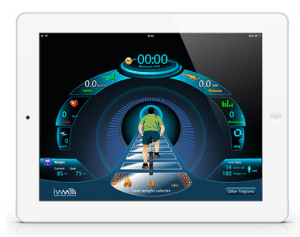 The MyLiveLight workout display includes your stats and a moving avatar. 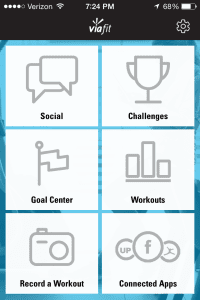 In addition, it is possible to join groups within the online account through which you can participate in group workouts and challenges. Your progress can be shared via social media. If you want to run a custom workout, but watch Netflix instead of the avatar, it is possible to switch over to your movie without interrupting the data collection from the MyLiveLight app. The best feature associated with MyLiveLight is the Integrated Weight Management. A smart scale is included with many of the Yowza machines that links via Bluetooth to your treadmill. After stepping on the scale to record your weight, the program uses this information to update your stats and suggest an appropriate workout to correspond to your weight goals. It seems like all of the big name brands are jumping on the fitness tracking bandwagon. These final two technologies are both free and sync with a free downloadable app for your smart device. First, Sole Fitness incorporates Bluetooth technology into their machines that links to a free Sole Fitness app. This system syncs with popular apps you may already be using like AppleHealth and MyFitnessPal. Next, Bowflex uses the Free Results Series App to help their users keep track of their workout data. This technology works on their treadmills and on their unique Bowflex TreadClimbers. These machines are a combination of stair stepper, treadmill, and elliptical and provide a workout much different from the standard treadmill. If you are interested in this type of machine, it is good to know that some treadmill technology exists to aid your fitness progression. Bowflex also has the Max Trainer line that uses a very simple analogue display to provide a killer HIIT workout that will burn large amounts of calories in very short workouts. There you have it! Four unique technologies that can help you track your fitness in the 21st century. Now that you have an idea how all of the programs compare, take a look at some of the treadmills available from each company. With these interactive treadmill technologies, you can be sure that your treadmill workout will never be boring again! – What are your experiences with these technologies? – What else do you do to take the boredom out of exercise?